Please refer to our stock # 1-0810 when inquiring. 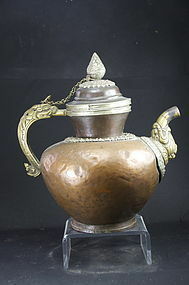 A superb tea kettle, its body made of copper, its handle and spout made of bronze and cast in the shape of dragons. On the lid , around the neck and at the base of the spout, a silver repoussé floral decoration. A chain links the lid to the body. Tibet, 19th century. Height:10 1/4" (26 cm). Obvious signs of use and age, otherwise very good condition. NOTE: The kettle is not cleaned: our principle is always to leave the patina on an object, leaving it to the buyer to decide if it will have to be cleaned or not. A Fine Tsampa Bowl, Tibet, 19th C. Silver Lime Box, Tibet, 19th C. Ivory and Silver Snuff Bottle, Tibet, 19th C.